Last year, I supervised three students at the USF Patel College of Global Sustainability who did their internships in Malawi Africa. One of the major issues the students encountered was human animal conflicts. The conflicts ranged from small game poachers looking for food for their survival, to fishermen fishing illegally with some being eaten by crocodiles, lions getting caught accidentally in animal snares, organized crime threats for poaching rhinos, and conflicts with elephants eating up the crops and gardens of nearby villagers.Of all the conflicts, the elephant conflict was the most serious with several people being killed nearby to where the students were staying. 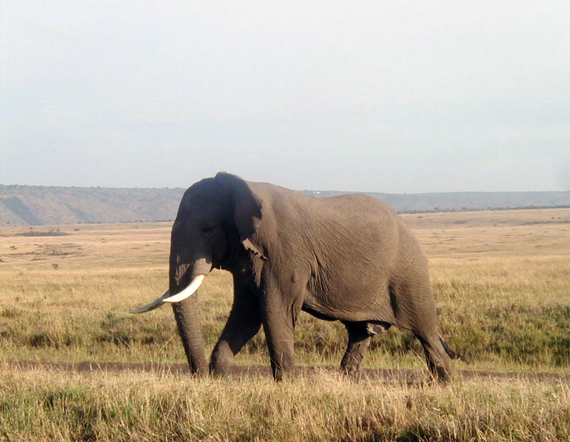 Seven people were killed over several elephant encounters during their short internship. While hippos are thought to be the most dangerous animal in Africa, this is not the case in the Liwonde National Park in Malawi. Despite the hippos outnumbering the elephants with about 1000 hippos and 650 elephants, elephants seem to be the greater threat in this part of Africa. The students discovered that what was happening was that as poachers would cut down the fence of the National Park to trap small game, the elephants would then leave the park to feast on the gardens and crop land of the nearby villagers. It appears that most of the deaths occurred at night when the Villagers would attempt to scare the elephants away with screams and gun fire. The elephant did not scare though and instead attacked and killed some of the villagers. While it is unlikely that one visiting Africa will be killed by an elephant, you may be surprised that elephants are considered the 4th most dangerous animal in Africa behind the hippo, mosquito, and other humans. With only about 300 elephants total in the U.S., it is reported that there is a greater chance of an elephant keeper being killed by an elephant than for a police officer being killed in the line of duty in the U.S.
Globally, elephants are reported to kill about 500 humans a year. Most of the deaths to tourists by elephants can be attributed to poor management practices of the tourist facility and/or ignorance of elephant behavior by the tourist themselves. This led me to seek out expert advice from my friend and Elephant Care expert John Lehnhardt at the National Elephant Center (NEC), near Fellsmere, Florida. John and the NEC graciously offered a short seminar for our sustainable tourism students at the USF Patel College of Global Sustainability where I serve on the faculty. Photo: USF Patel College of Global Sustainability Sustainable Tourism student group with John Lehnhardt. The National Elephant Center has become a model for sustainable managed care of elephants and the lessons they have learned can go a long way to reduce the human animal conflicts in Africa. One of the key lessons that John taught our students going to Malawi this year, is that elephants need their space. They need space to roam, space to browse and eat (They eat 400 to 700 lbs of food a day), and perhaps most important, they need personal space. As human population has increased in Africa, it has often been at the expense of habitat for elephants. The loss of habitat coupled with poaching has seen the African elephant population decline from about 3.5 million to 600,000. In central Africa the elephant population is now only 10 percent of historic levels for the forest elephants. With the threat of climate change there is risk of more habitat loss to elephants through the increase of warmer and dryer periods. This in turn can bring more human animal conflict if current habitat is not protected. Almost ten years ago, Dr. Richard Leaky has warned that climate change could be a greater threat to elephants than poaching. Unfortunately, little has been done to address this warning. At the National Elephant Center, elephants are rotated through several 20 acre areas that allows them to roam, browse, and have access to plenty of water. The NEC is a model for giving elephants necessary space to live their normal life without human added stressors. Unlike some elephant facilities, the elephants at the NEC are not chained at night and the elephants themselves maintain discipline in their social interactions. Elephants also need their personal space. John Lehnhardt shared that in his early career he was almost addicted to the touch of elephants each day but later shifted his thinking that it was humans needing the touch not the elephants and they were much better off to have their own personal space and to have social interaction with other elephants not humans. This is the standard that the National Elephant Center has set for his model care facilities and programs. Allowing elephants to have enough distance from humans so they can have their personal space is maybe the best lesson our students learned for their own safety as well as the well-being of the elephants. Although John Lehnhardt has worked with elephants for almost four decades, he acknowledges that he is still learning. What he has learned and what they are still learning at the National Elephant Center are techniques to manage elephants in individual and multiple herds in multiple areas. These lessons will be invaluable for sustainable tourism management practices now and in the future. I had an opportunity to interview John Lehnhardt and the interview can be viewed below. The 225 acre National Elephant Center provides training and exhibits "best practice care" for both African and Asian elephants. The Center provides a much needed support facility for members of the Association of Zoos and Aquariums. It is also a center to provide the larger public opportunities for increased awareness of elephant issues and needs. You can become a member of the National Elephant Center if you want to support this worthwhile cause for this model of excellence for elephant care.